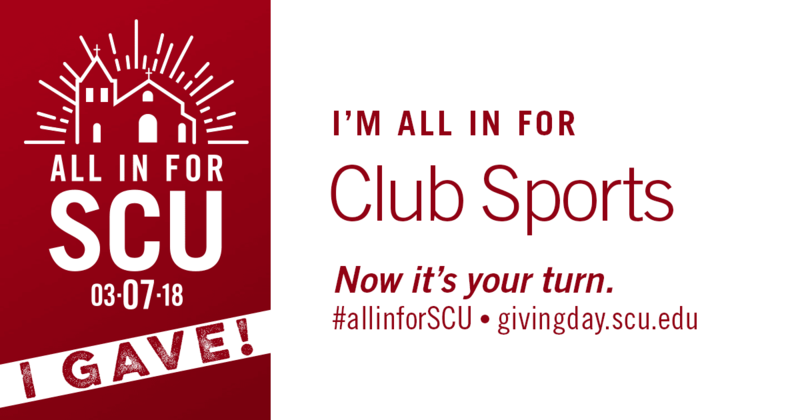 Club Sports & Campus Recreation has raised $ 30,890 from 195 gifts! ARE YOU ALL IN FOR FOR CLUB SPORTS? YOU can help build momentum for the causes you care most about by saving the image below and sharing it on your social media sites to show your Bronco pride! Being a member of the Club Sports Program is an amazing and valuable experience that goes beyond the realm of athletics. Our student-athletes compete at the highest level, build lifelong friendships, become more dedicated and focused, and realize that discipline, hard work, and representing SCU connects them to the Bronco community and the entire world. Your generosity contributes to this experience and we all thank you for your support!